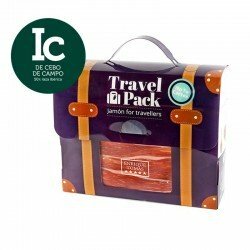 A sachet with sliced ham ready to open and enjoy with 80 grams of the best quality Enrique Tomás Iberian Cebo de Campo ham shoulder. All the “cebo de campo” products are obtained from Iberian pigs that have been fed in a controlled manner, following three stages of feeding which include feeding with feed and cereals and a period of freedom in the pastureland. Cebo de Campo is a new type of Jamón Ibérico that we offer at Enrique Tomás and which, like all our products, has a high quality, an impeccable selection process and a flavour that you will enjoy as never before. Maintaining all the characteristics of the already known jamón ibérico de cebo, the pigs destined to produce Iberian hams and ham shoulders of cebo de campo have gone through a controlled feeding in three phases: feed and cereals, released into the pastureland with wild and natural feeding, and finishing of fattening with feed and cereals again. A ham shoulder is the result of curing the front leg of a pig in salt. Its taste is more intense than that of jamón because there is the same amount of bone and much less meat than in a jamón. It needs less months of curing than a jamón. Once we have the pig's leg ready, the first thing we have to do is prepare it for salting. The cook makes a v-cut on the pig's rind and decides how much external fat to leave. The more fat it has, the less salt it will absorb and the sweeter it will get. Once the previous operation has been performed, the leg is buried in salt for an average of two weeks. If the chef decides to extend this period, the ham shoulder will be tastier. From that moment on, depending on the type of ham shoulder, we are going to make, the characteristics of the leg and the flavour we want to obtain, the leg will be hung in the special celler until it is optimum for consumption.